Wash the lentils. Peel the carrot and the shallot and then finely dice. Wash and pick the chervil. Wash the chives and then cut half into small pieces and the rest into longer strips to use in the herb salad. Heat a large frying pan and add half of the olive oil, the carrots, garlic and the shallot. Sweat until soft and then add the lentils and twice their volume in water. Bring to the boil, reduce to a simmer and then cook over a low heat for 20 minutes. Once cooked, drain the lentils and then season with salt and pepper and add the chopped chives. Mix together the rest of the olive oil and the vinegar. Heat a frying pan to very hot. Season the foie gras with salt and then add to the pan. Cook for 1 minute on each side and then remove from the heat (the heat from the pan will finish cooking the foie gras). Remove the foie gras from the pan and rest on kitchen towel to absorb the grease. Season with salt and pepper. 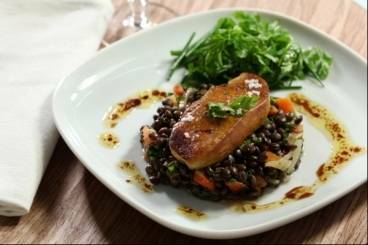 Serve the foie gras on a bed of lentils and finish with a handful of the fresh herb salad and a drizzle of the vinaigrette.